Well, I'm late and I admit it. For those of you who know me, you know that I am late for almost everything in my life. Late getting up in the morning, late for work, late arriving to functions, late meeting my DH for dinner, late picking up my DD from school (late in getting her there), late with dinner, late with projects, etc, etc etc......the list goes on and on. Chances are, if you know me, you have had to experience my tardiness in some form or fashion (and you know who you are and I do apologize profusely). I have begun to realize that it's just a part of who I am, and I am slowly beginning to accept it. Accept it, instead of change it. I have realized that it's just not going to change people! From the beginning of time I have been late for almost everything (except in paying bills, sending cards for birthdays, and giving my dog a bath...go figure!) When I am actually on time for something, it somehow feels just "wrong" to me or "off" in some way. I feel somehow that I'm wasting time if I show up for something early. I mean, there's 5,10,15 minutes or so that I could have spent doing something else, rather than just "being early" or "waiting" for something to start, right? I suppose that it works the other way for the other person - why should they have to wait around for me? Is my time more precious than theirs, for instance? No way! It just is what it is, I guess. I go through time period where I a am on time, where I try to change, but then revert pretty quickly back to my late self. 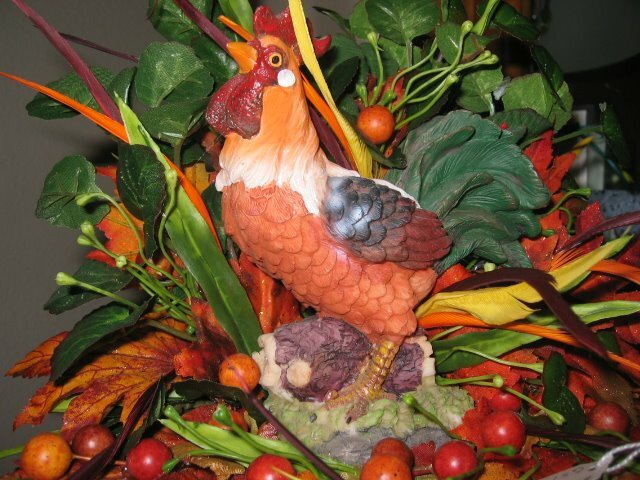 So, I guess in one sense, I have added posting on this blog to that list - the list of things I am late for. This post, being one of them. I meant to post right on New Year's Day, or pretty darn close to it anyway, and look, it's now December 18th, and I am just now doing my New Year's post! I guess I vow to be more productive in posting on a regular basis this year - vow to get more knitting done (although I am not sure if that will actually happen), and vow to try and not be late for family functions, late to work, or late to pick up my daughter from school (although I can't guarantee anything). I have so many UFO's from last year, that there are just too many to count. I began, began, began projects last year, but somehow didn't finish as many as I'd hoped (although the end of the year I seemed to bust out lots of things for the holidays, but that doesn't really count). So, for that reason, because there are just too many to name, I have chosen the one, the special one in my mind, that I would like to complete before the end of January. Realistically, with everything going on, this is the only one that I will be able to complete before the end of January. I went through all of my projects, even ones I hadn't started, and my eyes kept being drawn back to this one in particular. 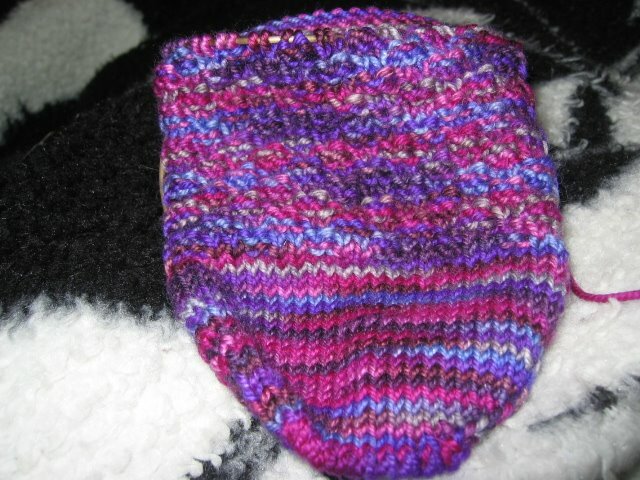 NK blessed me with this lovely (my favorite, actually) skein of STR in Purple Rain this year, and I started a pair of socks with it, and had every intention of finishing them by now; however, life got in the way. Holidays happened, work was always rearing it's ugly head, and other priorities seemed to take over. Purple Rain was put on the back burner, but not forgotten. 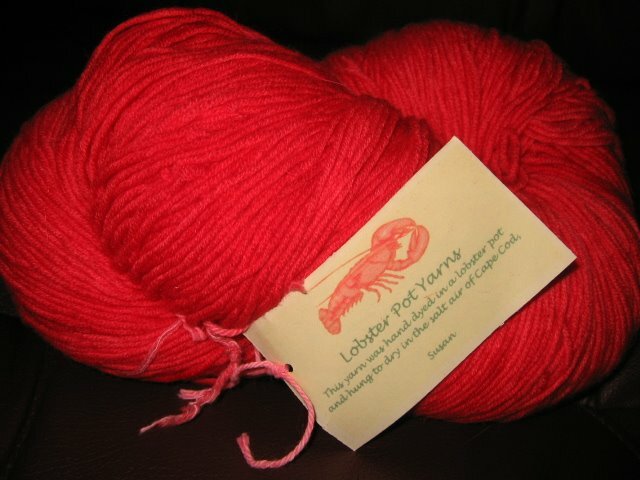 This is the wonderful Lobster Pot Yarn from Cape Cod Fibers. I'm sure we will be seeing this around here a little more often in the near future. Knit on! Hi Wool Girl! Love those Purple Rain socks! I can't wait to see that Lobster Pot cashmere become an FO!!! ;)Yum!! Happy knitting!